You are here: Home / From the Experts / Pawning for Payroll? Try Factoring Invoices Instead! Looking for further proof small businesses are in need of alternative financing options like factoring? The ongoing credit squeeze has companies turning to an unlikely lender…the pawnshop! Many pawnshops are reporting that over half their customers are now small business owners that are basically pawning to meet payroll. 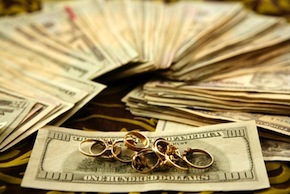 While selling the gold is one option, using a pawnshop allows the business owner to utilize the assets as security for a loan. If the loan isn’t repaid within the specified time frame, generally 30 to 60 days, the pawnbroker keeps the items. The advantage is fast cash without credit checks or restrictive guidelines. The downside of course is the interest rate. It’s not uncommon to see monthly interest rates of 5%, as reported by one business owner using gold and jewelry for a $20,000 loan. Rather than pawning for payroll, small business owners can turn to less expensive options like selling accounts receivable. In today’s competitive market factoring fees often average less than 5%. Instead of making a loan, factoring companies purchase outstanding invoices at a discounted rate. They look to the strength of the customer or debtor on the invoice instead of the business selling the invoice, making it a viable option for businesses that aren’t considered “bank quality” to traditional lenders.